RIGA, Latvia -- In a significant move to deter possible Russian aggression in Europe, the Pentagon is poised to store battle tanks, infantry fighting vehicles and other heavy weapons for as many as 5,000 American troops in several Baltic and Eastern European countries, American and allied officials say. Stryker vehicles from the Army’s 2nd Cavalry Regiment took part in a military exercise in Riga, Latvia. The proposal, if approved, would represent the first time since the end of the Cold War that the United States has stationed heavy military equipment in the newer NATO member nations in Eastern Europe that had once been part of the Soviet sphere of influence. Russia’s annexation of Crimea and the war in eastern Ukraine have caused alarm and prompted new military planning in NATO capitals. It would be the most prominent of a series of moves the United States and NATO have taken to bolster forces in the region and send a clear message of resolve to allies and to Russia’s president, Vladimir V. Putin, that the United States would defend the alliance’s members closest to the Russian frontier. 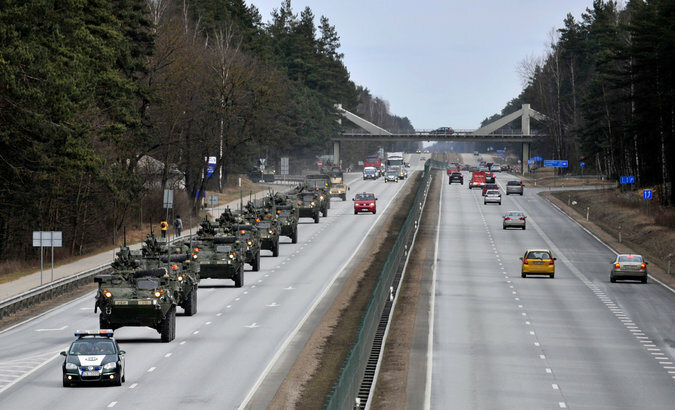 After the expansion of NATO to include the Baltic nations in 2004, the United States and its allies avoided the permanent stationing of equipment or troops in the east as they sought varying forms of partnership with Russia. “This is a very meaningful shift in policy,” said James G. Stavridis, a retired admiral and the former supreme allied commander of NATO, who is now dean of the Fletcher School of Law and Diplomacy at Tufts University. The amount of equipment included in the planning is small compared with what Russia could bring to bear against the NATO nations on or near its borders, but it would serve as a credible sign of American commitment, acting as a deterrent the way that the Berlin Brigade did after the Berlin Wall crisis in 1961. “It’s like taking NATO back to the future,” said Julianne Smith, a former defense and White House official who is now a senior fellow at the Center for a New American Security and a vice president at the consulting firm Beacon Global Strategies. The “prepositioned” stocks — to be stored on allied bases and enough to equip a brigade of 3,000 to 5,000 soldiers — also would be similar to what the United States maintained in Kuwait for more than a decade after Iraq invaded it in 1990 and was expelled by American and allied forces early the next year. The Pentagon’s proposal still requires approval by Defense Secretary Ashton B. Carter and the White House. And political hurdles remain, as the significance of the potential step has stirred concern among some NATO allies about Russia’s reaction to a buildup of equipment. “The U.S. military continues to review the best location to store these materials in consultation with our allies,” said Col. Steven H. Warren, a Pentagon spokesman. Senior officials briefed on the proposals, who described the internal military planning on the condition of anonymity, said that they expected approval to come before the NATO defense ministers’ meeting in Brussels this month. The current proposal falls short of permanently assigning United States troops to the Baltics — something that senior officials of those countries recently requested in a letter to NATO. Even so, officials in those countries say they welcome the proposal to ship at least the equipment forward. “We need the prepositioned equipment because if something happens, we’ll need additional armaments, equipment and ammunition,” Raimonds Vejonis, Latvia’s minister of defense, said in an interview at his office here last week. “If something happens, we can’t wait days or weeks for more equipment,” said Mr. Vejonis, who will become Latvia’s president in July. As the proposal stands now, a company’s worth of equipment — enough for about 150 soldiers — would be stored in each of the three Baltic nations: Lithuania, Latvia and Estonia. Enough for a company or possibly a battalion — about 750 soldiers — would be located in Poland, Romania, Bulgaria and possibly Hungary, they said. American military specialists have conducted site surveys in the countries under consideration, and the Pentagon is working on estimates about the costs to upgrade railways, build new warehouses and equipment-cleaning facilities, and to replace other Soviet-era facilities to accommodate the heavy American weaponry. The weapons warehouses would be guarded by local or security contractors, and not by American military personnel, officials said. Positioning the equipment forward saves the United States Army time, money and resources, and avoids having to ship the equipment back and forth to the United States each time an Army unit travels to Europe to train. A full brigade’s worth of equipment — formally called the European Activity Set — would include about 1,200 vehicles, including some 250 M1-A2 tanks, Bradley fighting vehicles, and armored howitzers, according to a senior military official. The Army previously said after the invasion of Crimea last year that it would expand the amount of equipment it stored at the Grafenwöhr training range in southeastern Germany and at other sites to a brigade from a battalion. Army units — currently a battalion from the Third Infantry Division — now fly into the range on regular rotations, using the same equipment left in place. They train with the equipment there or take it to exercises elsewhere in Europe. That, along with stepped-up air patrolling and training exercises on NATO’s eastern flank, was among the initial measures approved by NATO’s leaders at their summit meeting in Wales last year. The Pentagon’s proposal reflects a realization that the tensions with Russia are unlikely to diminish soon. “We have to transition from what was a series of temporary decisions made last year,” said Heather A. Conley, director of the Europe Program at the Center for Strategic and International Studies in Washington. The idea of moving prepositioned weapons and materials to the Baltics and Eastern Europe has been discussed before, but never carried out because it would be viewed by the Kremlin as a violation of the spirit of the 1997 agreement between NATO and Russia that laid the foundation for cooperation. In that agreement, NATO pledged that, “in the current and foreseeable security environment,” it would not seek “additional permanent stationing of substantial ground combat forces” in the nations closer to Russia. Many in the alliance argue that Russia’s increasingly aggressive actions around NATO’s borders have made that pact effectively moot. The Pentagon’s proposal has gained new support because of fears among the eastern NATO allies that they could face a Russian threat. “This is essentially about politics,” Professor Galeotti said. In an interview before a visit to Italy this week, Putin dismissed fears of any Russian attack on NATO. “I think that only an insane person and only in a dream can imagine that Russia would suddenly attack NATO,” he told the newspaper Corriere Della Sera.